Translation: Naoko IkenoWe asked them about the Neo2 Magazine and Spain. First of all, please introduce yourself as well as your back ground. 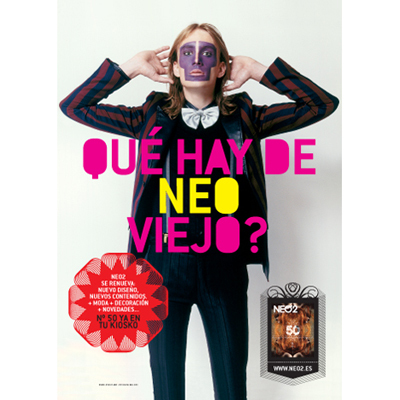 Neo2 is a paper magazine edited by Ipsum Planet, a creative studio in Madrid, Spain. Ipsum Planet has 8 years working with many national and international clients as: Cartier, Lego, Adidas, Lois… Our work is aimed by now to the graphic/printed creativity. Please tell us about your magazine ‘NEO2’. What is the aim of it? Neo2 is a tendencies magazine (art, fashion, industrial design, architecture, photography….) We try to let know and to support hispanic creatives basically, but we are also open to other countries creatives. Then we would like to ask about Spain. What is hot now? Would you recommend any cafe or restaurant in Madrid, Spain? “La Gracia de Montera” in Caballero de Gracia Street (near Gran Via). It is a very cheap restaurant with very actual and fine decoration. They don’t make reservations and you must go 2 hours before to have a place.There are a lot of plates of a very good Mediterranean food. “El Cayetano” in Encomienda Street (near El Rastro). It is not a restaurant is more or less a very ugly bar/seafood shop in a little dangerous area in Madrid. On Sunday mornings is full of people so it is better to go any other day. It is the cheapest place in Madrid to eat seafood and drink beer.